EJS uses the concept of a "workspace" to organize your work. A workspace is a folder/directory where EJS stores your simulation files for a given project. A workspace can contain an unlimited number of simulations. Inside a workspace folder/directory, you will find four subfolders/subdirectories. "config": This folder/directory contains configuration files created by EJS when you change its run-time options. "export": This is the default folder/directory which EJS offers you when you create self-executable packages (JAR files) or HTML files for deployment. "output": This is a folder/directory that EJS uses to store intermediate files created when you run a simulation. "source": This is the folder/directory where you must save your simulation (XML) files, together with auxiliary files, such as GIF images or data files. You can have more than one workspace in your computer, if you wish. For instance, to separate different projects, or types of simulations. The EJS console allows you to switch workspaces. 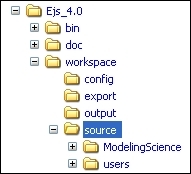 To create a new workspace, just create an empty folder/directory in your computer hard disk and use the appropriated EJS Console option (in the 'Basic options' tab) to select it. EJS will automatically create the necessary four folders/directories listed above inside it. When you first run EJS, the console will ask you to choose a workspace folder/directory. This must be a writable folder/directory anywhere in your hard disk. You can choose to use the workspace included in the distribution, i.e. the "workspace" directory in the "EJS_X.X" folder/directory created when you unzipped the EJS bundle. This workspace has some sample simulations in its "source" folder/directory. But it is recommended to create a new folder/directory in your usual personal directory. The file dialog that allows you to choose the workspace has a check box that when checked will copy all the examples files of the distribution to the new workspace. Note when reinstalling EJS: If you need to reinstall EJS, or upgrade to a newer version of it, follow the same procedure to unpack the new EJS bundle. You may want to make a backup copy of the existing "workspace/source" folder/directory in the installation directory (not your personal one) if you did changes to the sample simulation files included in it. There is no problem in overwriting or deleting the previous copies of the "bin", "doc", or other folders/directories under "workspace", and the "EjsConsole.jar" file. Reinstalling EJS has no other effect on your personal workspace.